It’s no secret that I like to make my own cleaners. I’ve written before about how vinegar and water makes a great homemade all purpose cleaner, how I discovered that club soda works wonderfully as a homemade window cleaner, and how baking soda does a fine job as a homemade scrub. In fact I’ve grown to LOVE my homemade cleaners and almost use nothing else now. Yes, ALMOST use nothing else. Almost. 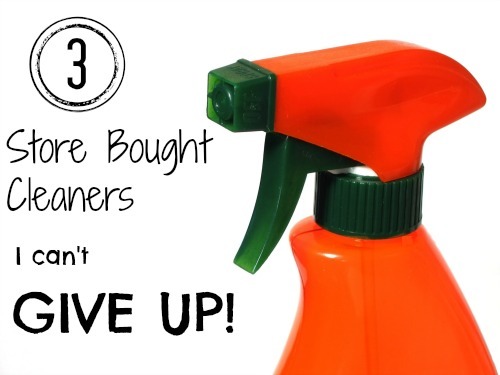 There’s a few store bought cleaners on my shelf that I can’t give up. Even though I love to make my own stuff, I can’t bring myself to get rid of three great performers that I haven’t been able to duplicate. Is It the PH level? 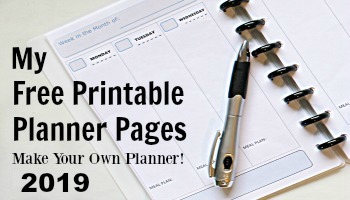 Why is it that for some cleaners it’s really hard to duplicate a homemade version? I’m not a chemist, but I’m thinking it has something to do with the ph level. If you’re not familiar with the ph scale, it measures how acid or alkaline (base) a water based substance is. The scale goes from 0 to 14, with 0 being very acid and 14 being very alkaline. In the middle of the scale we have pure water which is a 7 and is neutral (being neither acid or alkaline). Maybe the store bought cleaners I can’t give up fall a little more extremely on one end of the ph scale or the other. Homemade versions made with friendlier ingredients are often more in the middle of the ph scale. And did you know that for almost every store bought cleaner on the market, you can find a Material Safety Data Sheet online that the manufacturers are required to publish? Most of the chemical information disclosed on these data sheets is mumbo jumbo to me, BUT I did find that these sheets will always include the ph of the cleaner, usually in Section 9 of the sheet. When I want to give my linoleum or vinyl floors a really super good cleaning, I get down on my hands and knees with a scrub brush, a bucket of water, and a bottle of Greased Lightning. 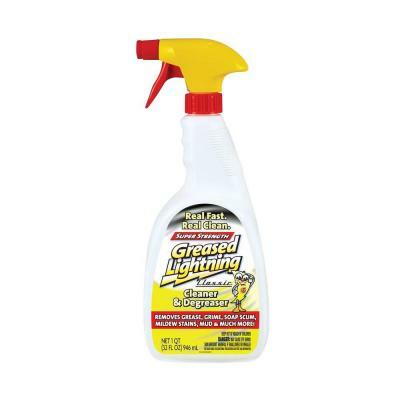 Greased Lightning is labeled as a degreaser and it seems to be able to “cut it” when lots of other cleaners can’t. It has a ph of 12.8 so it’s very alkaline. (click here for the Data Sheet). This cleaner can get the grime and gunk out of the little nooks, crannies, and lines on a floor and I’ve yet to find anything else quite like it. Of course it can be used on more than just floors too and would be good for any heavy duty cleaning job. Check the Dollar General stores that usually carry this product. Bar Keepers Friend is a powdery scrub that has an amazing ability to get things super shiny and clean. It has a ph of only 1.5 to 2.5 to it’s very acidic. (Click here for the Data Sheet) I first came across this product when my Dad was cleaning some pots and pans with it and they were the shiniest pots and pans ever! I like to use it on my sink and my tub when they need a good deep cleaning. What’s interesting to me about this product is that it’s acidic without being a liquid. Most homemade cleaners with a high acidity use either vinegar or lemon juice and are liquid cleaners. When you try to add an abrasive like baking soda (which is alkaline) to either vinegar or lemon juice, you neutralize the acidity. Bar Keepers Friend can usually be found with other cleaners in most grocery stores and supermarkets. Spot Shot became my go-to carpet stain cleaner when I had a long-haired cat that routinely threw up hairballs on my carpet when I wasn’t looking. A squirt or two of Spot Shot, a damp cloth, and a little scrubbing, and carpet stains would disappear. I’ve grown pretty dependent on my bottle of Spot Shot over the years. The ph of this cleaner is a little more mysterious to me as it has an almost neutral ph! The data sheet shows a ph of between 7 and 9. (click here for the Data Sheet). This cleaner doesn’t fall extremely either way with acidity or alkalinity, but it does a great job of getting out all kinds of spots and odors from carpeting. It’s also easily found in grocery stores and supermarkets. So that’s what it’s like at my house. I love homemade cleaners, but like to keep these guys around yet too. How about you? Do you like to make your own cleaners too but still have a few store bought ones that you can’t quite part with? I have fixed the Amazon link in the post too – thanks for bringing that to my attention. I haven’t heard of Folex but it sounds like it can really do the job! I like Barkeeper’s Friend as well, just not for copper. I also use something called “Incredible Pink,” which is a heavy duty degreaser. Even though the label says “biodegradable, non-toxic , non-flammable and phosphate free I’m pretty sure it’s lethal because it makes me cough every time I use it. so I only use it on grease that I’m ashamed to admit to. Barkeeper’s friend is about 10% oxalic acid, along with a mild detergent and an abrasive agent. Should be easy enough to make. The spray is just a 3% solution. Seems to be about 9 dollars a kilo on Amazon …. Besides sinks and tubs, I use Bar Keepers Friend on glass-top stoves, and love it for sticky greasy counter tops too. It rinses off much better than Comet or Ajax! I work for a cleaning company and consider Bar Keepers Friend to be my best friend. Regarding your use of Greased Lightning, I’m wondering if you’ve ever tried just plain old sudsy ammonia. In the summers, I work part time in the kitchen of a lodge we frequent. I was tasked with cleaning the greasy floors and found the sudsy ammonia and water works better than anything I’ve ever tried. I’d also like to thank you for your great website. Keep the good stuff coming! You might be right Brigitte! I checked the ph of ammonia and it is quite alkaline (11.5) just like the Greased Lightning. I wish I could handle the smell of ammonia better. That’s why I’ve never used it much. The sudsy ammonia is lemon scented. Not at all bad on the olfactory. I still buy Lysol toilet bowl cleaner and original blue Dawn. You should try rubbing alcohol to clean your floors with. It is amazing. No sticky residue, gets up grime, and cleans really well. I just add about 1/2 cup to about 2 gallons of water. You can also use rubbing alcohol to make a great disinfecting cleaning spray, remove stains from carpet and upholstery, clean the ring in the bathtub, polish the faucet and other hardware, clean just about anything metal and make it shine, and clean mirrors. Also, dawn and hot water make a great window wash, just a few drops in a bucket of water, not enough to suds up, and two terrycloth rags. Wash with the dawn mixture, dry with the other rag. Much better than sprays, which don’t wash the windows, they only polish them. I love all these ideas Angi! I have tried rubbing alcohol to shine faucets, and yes, it worked great! I’m going to be trying it on the floors too. I love Swiffer floor cleaners and Mr. Clean Magic Erasers. I try to be aware of how cleaners affect the environment, but wow, those two products work too well to give up! I’ve tried Barkeeper’s Friend, and it’s just OK to me. However, I am a huge fan of Cameo powder cleaners…nothing else seems to make my stainless shine as bright or the white as white in my bathroom. I’ve used it for years. I haven’t heard of Cameo powder cleaners. Now you’ve got me curious! I tried and tried to use baking soda alone on my pans. It does a fair job (and i don’t neutralize it). I found it works best for cooked on stuff (i have old Corning Ware pans that generally clean up very well). I fill the pan/pot with water, add a few tablespoons of baking soda and a little dishwashing soap, and turn the burner on. I let it boil for a few minutes, and then let the water cool a bit. This generally does the trick – but if it doesn’t i use Bon Ami cleanser. I can’t seem to get away from a cleanser. And i still use an organic/”earth friendly” dishwashing soap. That’s a good idea to boil some water with the baking soda and dish soap. I bet that helps clean the pots and pans. I’ll have to give that a try. Dump the Bon Ami and try Bar Keepers Friend…not an abrasive cleaner and it works much better. I used to swear by Bon Ami, but after finding BKF, I have never looked back. Bleach. Sometimes I just need to smell the clean smell of bleach in the bathroom to “KNOW” it is really clean and disinfected.